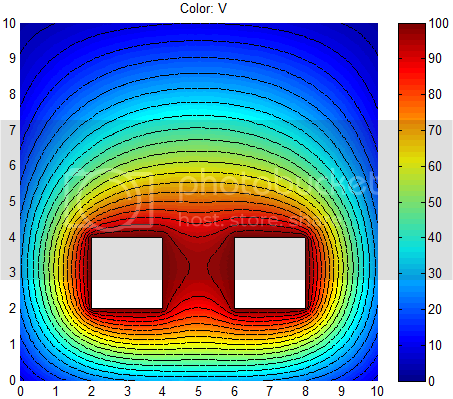 GMAT Forums • View topic - PDETOOL Matlab - Plotting a linear element? PDETOOL Matlab - Plotting a linear element? I've written a script that creates a few rectangles and gives the surface plot in the PDE toolbox. 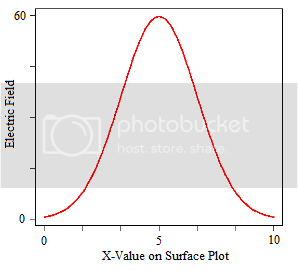 What I would like to do is to also plot the values for a linear element in the surface plot i.e. for a given value of x or y. Re: PDETOOL Matlab - Plotting a linear element? Using the pdetool I created 3 rectangles (using the first method you described), 1 large rectangle (R1) and 2 smaller rectangles (R2 and R3) that are within R1 but not in contact. By applying the formula R1-(R2+R3) and solving it as an electrostatic system in the toolbox I essentially get the cross-sectional surface plot of 2 electrodes (given below). I guess my fundamental problem is not being able to access the information from the surface plot to then manipulate the data. Any insight anyone has into the problem would be greatly appreciated!